Gauge symmetries can be viewed as analogues of the equivalence principle of general relativity in which each point in spacetime is allowed a choice of local reference (coordinate) frame. Both symmetries reflect a redundancy in the description of a system. The history of ideas is a history of gradually discarding the assumption that it’s all about us. No, it turns out, the earth is not the center of the universe — not even the center of the solar system. No, it turns out, humans are not created by God in his own image; they’re just one species among many, descended not merely from apes, but from microorganisms. Even the concept of “me” turns out to be fuzzy around the edges if you examine it closely. Conversely, if you have to choose between two theories, prefer the one that doesn’t center on you. This principle isn’t only for big ideas. It works in everyday life, too. With the financial and critical success of The Dark Knight, Warners said of the reboot Superman film, “We’re going to try to go dark to the extent that the character allows it.” Legendary Pictures president Thomas Tull added that “Superman needs a powerful antagonist, a worthy opponent,” wanting to evoke Superman as an “angry God”. In geometry, the notion of a connection makes precise the idea of transporting data along a curve or family of curves in a parallel and consistent manner. There are a variety of kinds of connections in modern geometry, depending on what sort of data one wants to transport. For instance, an affine connection, the most elementary type of connection, gives a means for transporting tangent vectors to a manifold from one point to another along a curve. An affine connection is typically given in the form of a covariant derivative, which gives a means for taking directional derivatives of vector fields: the infinitesimal transport of a vector field in a given direction. Connections are of central importance in modern geometry in large part because they allow a comparison between the local geometry at one point and the local geometry at another point. Differential geometry embraces several variations on the connection theme, which fall into two major groups: the infinitesimal and the local theory. In physics, a gauge theory is a type of field theory in which the Lagrangian is invariant under a continuous group of local transformations. The term gauge refers to redundant degrees of freedom in the Lagrangian. The transformations between possible gauges, called gauge transformations, form a Lie group which is referred to as the symmetry group or the gauge group of the theory. Associated with any Lie group is the Lie algebra of group generators. For each group generator there necessarily arises a corresponding vector field called the gauge field. Gauge fields are included in the Lagrangian to ensure its invariance under the local group transformations (called gauge invariance). When such a theory is quantized, the quanta of the gauge fields are called gauge bosons. If the symmetry group is non-commutative, the gauge theory is referred to as non-abelian, the usual example being the Yang–Mills theory. 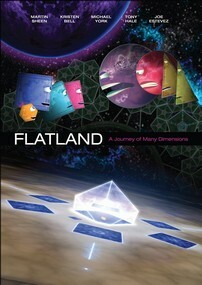 Flatland: The Movie is a good mathematical movie. But it is too short. A separate and older criticism of string theory is that it is background-dependent — string theory describes perturbative expansions about fixed spacetime backgrounds. Although the theory has some background-independence — topology change is an established process in string theory, and the exchange of gravitons is equivalent to a change in the background — mathematical calculations in the theory rely on preselecting a background as a starting point. Or rather, a large organization could only avoid slowing down if they avoided tree structure. And since human nature limits the size of group that can work together, the only way I can imagine for larger groups to avoid tree structure would be to have no structure: to have each group actually be independent, and to work together the way components of a market economy do. Learning lisp will alter your life. Your brain will grow bigger than you ever thought possible. Paul Graham himself was completely written in lisp, by an earlier version of himself, also written in lisp, by an earlier version of lisp. It’s lisp, paul graham, lisp, paul graham, all the way down. I once read that all good non-fiction books are written in anger. At first I was taken aback by that. Then I realized [that] it was true. If you do write a book, you are implicitly saying that the world needs this book. Implicit in that is the accusation that the existing books are either incorrect or incomplete or both.